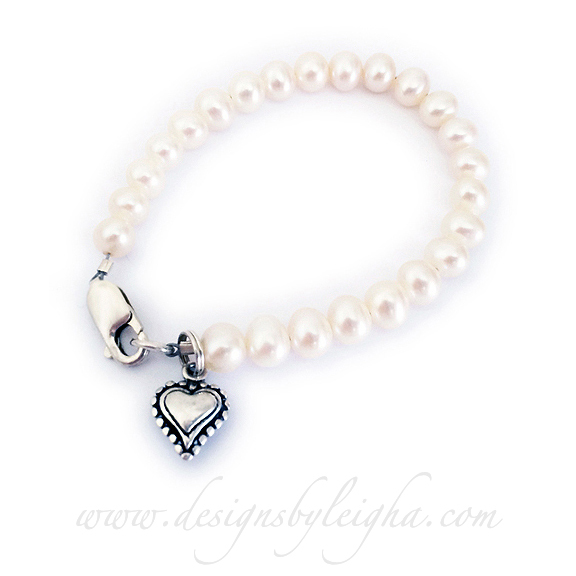 1-string bracelet shown with an add-on Beaded Heart Charm. This is a pearl bracelet with 6mm pearls by Swarovski. It is shown with an add-on Beaded Heart Charm. Everything is .925 sterling silver or Swarovski Pearls. You may add charms during the ordering process below. A 6 1/2" bracelet is shown. This bracelet comes with a Heart Lobster claw clasp with an extension to grow with your child. Size: Measure your wrist and add 1/2": 5" 5 1/4" 5 1/2" 5 3/4" 6"